Preventing inflammation in your body can be simple when you follow an anti-inflammatory diet. There are bundles of foods that cause inflammation, and cutting back on them will improve your overall health. Chronic inflammation can lead to worrisome health problems, such as heart disease, acne, and even cancer, so being aware of the foods that cause inflammation is crucial for a healthy lifestyle. On the other hand, temporary inflammation is important for your body as it helps fight off injuries and sudden infections. Unfortunately, in today’s world, much inflammation has become chronic due to the foods we consume, and it has become destructive to our systems. White sugar, deep fried foods and alcohol are obvious culprits, as are foods high in trans fats, gluten and dairy. Some foods, like peanuts and vegetable oil may be flying under your radar as foods you should avoid, so make sure to check out this handy list to get the low down on inflammatory foods to steer clear of. The good news is, there are certain foods to add to your diet that will help fight inflammation. Fatty, oily fish like salmon and tuna are high in omega-3 fatty acids, which reduce inflammation. Dark leafy greens fight inflammation due to their high antioxidant content, and berries are also super rich in anti-oxidants so they should be eaten as much as possible! Chia seeds, avocados, ginger and garlic have also been found to combat inflammation, so work them into your diet as much as you can. It’s amazing how much better you’ll start to feel once you start decreasing inflammation-boosting foods. We’ve outlined the top 15 foods to avoid in your diet and why below, and if you’re serious about following an anti-inflammatory diet, we highly recommend you check out the books The Anti-Inflammatory Diet %26 Action Plans: 4-Week Meal Plans to Heal the Immune System and Restore Overall Health (includes options for different dietary preferences, including the Paleo diet) and The Anti-Inflammation Cookbook: The Delicious Way to Reduce Inflammation and Stay Healthy (filled with delicious recipes!). White sugar, found in goodies like pop, chocolate bars and sweets is one of the biggest culprits of inflammation. It elevates blood glucose levels and is also highly addictive, which means if you start eating sugary foods, you’ll crave them more and more. Everything in moderation is okay, but the less white sugar you have in your system, the better. Sweeteners like Agave and Splenda are really no better than sugar itself, and might even be worse. Not only do they cause inflammation but they are also linked to other health conditions and diseases since sugar slows your white blood cell activity. This shouldn’t be surprising since so many people are prone to peanut allergies, but peanuts can cause major inflammation in the body. This extends to peanut butter and oil as well, so it’s probably in your best interest to switch to organic almond, cashew, or other nut butters. Sorry to be the bearer of bad news, but alcohol causes inflammation due to its negative effect on your liver function. Excessive amounts of alcohol can disturb the way your organs interact leading to inflammation and other diseases. If you can’t eliminate it, then drink it in moderation – everyone needs that glass of wine after a long day, but too much booze can be harmful. Frozen yogurt, cheese, ice cream, butter – all of these foods cause inflammation. Dairy is a common allergen, and unfortunately many dairy products contain hormones and antibiotics that your body is better off without. Over the past decade or so, gluten allergies have been on the rise. Found in foods with wheat, rye and barley (and of course the grains themselves), gluten products are known to result in inflammation. If you suffer from celiac disease, you have to cut gluten out completely, and even if you don’t it’s best to keep your gluten intake to a minimum to prevent inflammation. Quinoa and buckwheat are good alternatives. Vegetable oil is high in omega 6 fats, which can throw off your body’s balance of omega-3 to omega-6 fats, causing inflammation. Coconut oil is one of the best alternatives to cook with. Foods like white bread, white rice and white potatoes are refined carbs that are no good for your body. They are high-glycemic index foods that lead to advanced glycation end (AGE) products. This leads to inflammation, not to mention these foods are a main cause of obesity and other health concerns. Not that you should cut meat out completely from your diet, but the hormones and preservatives found in meat products these days can be troublesome. Wild-caught fish or tofu are healthier alternatives that won’t cause inflammation. Preservatives, additives and food colouring can all be found in processed foods, which are really bad for your system. Your body triggers an immune system response since it doesn’t recognize these things as food and you’re left with inflammation. Trans fats can be found in fast and fried foods, cookies, donuts, and even crackers. Consumption of these no-good fatty acids can spur excess inflammation as well as numerous other health issues such as heart disease and diabetes. MSG leads to liver inflammation, and since your liver is your most metabolic organ it creates systematic inflammation in the rest of your body. You should be eliminating MSG entirely. It can be found in many processed dinners, potatoes chips, restaurant foods, salty flavoured snacks, and much more. Do your research and try your best to cut it out. Genetically modified corn is really harsh on your system, and causes inflammation in your stomach. Avoid foods with high fructose corn syrup and corn oil for best anti-inflammatory results. As I’ve gotten older, I’ve become really sensitive to deep fried foods. Compared to baked and pan-fried food they’re harder to digest and by eating them you increase exposure to free radicals. It’s best to steer clear of deep fried foods altogether. Your body needs it to function, but too much sodium can wreak havoc on your system, leading to liver and heart disease, as well as high blood pressure. You don’t necessarily need to eliminate all these foods completely from your diet. Moderation is key to a healthy lifestyle. But avoiding these foods when you can is sure to make you feel better all around. 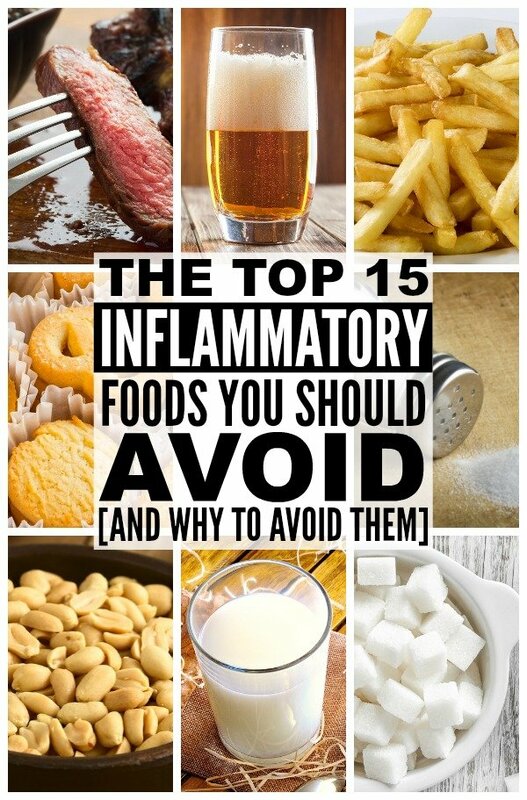 If you’re trying to follow an anti-inflammatory diet, and found this list of inflammatory foods helpful, please share it on Pinterest! And if you’re looking for more health-related tips and tricks, please follow our Health board where we share all kinds of helpful information!